Remove Burned Smell From Microwave — burnt popcorn, melted plastic, charred waffles, you name it… This quick cleaning tip removes all microwave odors quickly! Burnt popcorn… I don’t think there’s another odor that will linger on in the kitchen longer. I mean, why can’t the delicious fragrance of freshly baked cookies hang around for days? Unfortunately, the odor I’m dealing with today is even worse… burnt plastic and charred chocolate chip waffle, courtesy of one hungry seven-year-old boy setting the timer for FIVE minutes instead of 15 seconds. I cleaned the microwave thoroughly, but that horrible, overpowering scent endured. In a moment of desperation it occurred to me that coffee grounds work well at absorbing odors. So I mixed up approximately two tablespoons of ground coffee with one-half cup of water and popped it in the microwave for about three minutes. Voila — no more burnt smell! Check out these other quick tips to save you time and money in the kitchen. I am so going to try this! Today, my nephew forgot to put water in with his ramen noodles while cooking them for almost 4 minutes in the microwave! Completely burnt the ramen and the bowl was melted. Microwave smells so bad! Oh my goodness — I bet that smells awful. Hope it works for you! So you do actually heat it for 3 minutes? Not just sit it in there for 3 minutes. Hope doesn’t sound stipid!! Yep! I microwave it for about 3 minutes. Of course, keep an eye on it to make sure it doesn’t boil over, but I use a large Pyrex measuring cup and have never had a problem. 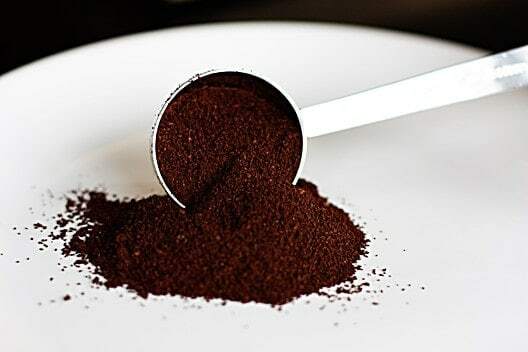 Can you use instant coffee? I haven’t actually tried instant coffee, but I don’t see why it wouldn’t work! I’ve tried lemon 1/2s in a bowl of water (2xs),wiping interior down with vinegar and there’s still a lingering smell from my burning popcorn by following the length of time listed in directions. Big mistake. It really is an awful lingering smell.